Following on from the theme of the day before yesterday this is also a former Cinema entrance, the St. George's cinema in Castlegate now used as a display annex for Fairfax House which is next door. York minster in juxtaposition on the horizon against the red brick and pantiles of the buildings in between. For thos of you trying to work out the location of where the shot was taken the only clue I'll give is "Blake Street". This fabulous looking building was built as a cinema but was converted to a furniture shop about fifty five years ago. Despite being called MacDonalds you can't buy fast food there, thank goodness! This is one of my favourite restaurants for lunch, my son lives next door and we meet him there for a reasonably priced tasty, well presented meal. Lunch time prices are reasonable and the food is good, well worth a visit. The interior is styled in an art deco manner and has a clean and tidy atmospher. When visiting, take the time to walk across the road to look at the upper story of the building which is full of character. Probably the smallest pub within the city walls but one of the most interesting with really well kept beers. There are several timbered buildings in York, this one is in Colliergate and is part of Blackwell and Denton's electrical shop. I have included this shot of the Minster taken from the walls along the stretch by Lord Mayors Walk between Monk Bar and Bootham Bar as another in the series of green spaces within the city walls. St. Denys Church in Walmgate stands on a mound above the height of the surrounding buildings. Charlie who winds and maintains the clock is looking at ways of getting the clock face to illuminate between sunset and sundown. This fine looking old church of St. Saviour in St. Saviourgate houses an attraction run by York Arachaelogical Trust called DIG. You can take part in a simulated excavation and unearth items from Roman, Viking, Mediaeval and Victorian periods. It is open every day except over Christmas when it shuts 24 - 26 December. It stands in the shadow of York's ugliest building. The wonderful Yorkshire Coastliner bus service linking Leeds tadcaster York Malton via bus routes 840 to Pickering and Whitby, route 843 to Scarborough and route 845 to Filey and Bridlington. All the buses used by Coastliner are low floored meaning disabled access is good. Although the through services no longer run to Castle Howard there is a shuttle service in operation between Malton Bus Station and Castle Howard run as route 842 that runs three times a day. For those that feel the need you can find the time of your next bus from your stop by texting your stop number to 64422 at a cost of 12p plus standard network rate. You should get a reply back within 60 seconds. Rail passengers to York and Scarborough can get a range of PLUSBUS tickets for use on services around York and Scarborough. You can also extend National Express coach tickets to extend your journey onto Coastliiner routes. All in all a top notch service with couteous drivers, a pleasure to use. This bus shown in the new livery is at the traffic lights for Foss Islands Junction. Ask anybody in York what they think is the ugliest building in the city and they will almost all reply "Stonebow". Many feel it is a boring concrete obelisk with no redeeming features. However, there are some out there who praise the fact that it has simple straight uncluttered lines. Don't count me in that group, although some of the buildings put up in the fifties and sixties are interesting in their design with fairly clean lines that do interest me like my old secondary school at Easingwold built in 1953. I am afraid that this building does nothing for me but cause irritation that it could have been allowed to become a blot on the landscape. It is to be hoped that the Hungate redevelopment just round the corner does not foist obscene buildings like this one on the people of York. York is well noted for a number of street performers. Here, Mr Yellow is being ably assisted by one of the young members of Black Pig Morris. Mr yellow was displaced from his usaul places that he performs in the city and was in St Helens square just before the Dance Festival Procession started from the Guildhall. If I have walked past this church once I have walked past it a hundred times (or more)! On Friday, I saw that it was open, the signs saying "Church Open" are a certain giveaway, and went in for the first time in 48 years. Inside, it is an absolute gem of a church. Above the alter below the window is a masterpiece depiction of the "Last Supper" in gold painted aluminium by artist Frank Roper which can only be described as awe inspiring and powerful. Having suffered heavily from bombing by the Luftwaffe air raid of 29th April 1942 during World War II the shape of the church is a little bit strange with half the structure missing making the outside view from Coney Street a little unsymetrical. For images of the damaged church and before it was damaged see the archives of "Imagine York : Historic Photographs"
The main west window was taken down and stored for safekeeping at the start of the war and placed into a new, rebuilt wall at the side of the church during restoration.It depicts the life of St. Martin le Grand also known as St Martin of Tours. The British Association has just finished a week long festival of science. Most events were held at York University but some were held in the centre of York. Here is a selection of some of those events. Airspeed Ltd. was founded in York 13 March 1931 by N.s. Norway, A.Hessel Titman, Lord Grimthorpe, Sir Alan Cobham and A.E. Hewitt. The building that was their factory is now sadly neglected and falling into a sad state of disrepair despite it having been an important part of aviation history, albeit for just two years before the company moved to Portsmouth in March 1933. N.S. Norway is probably better known to the general public as Nevil Shute the famous writer. The Airspeed AS.4 Ferry was designed by Sir Alan Cobham and built in York. The first one to fly, G-ABSI, flew from Sherburn in Elmet airfield. Why is this building being left to fall apart? Is it that we in York are so steeped in the history from the Roman ages to Victorian times that we cannot see the importance of aviation history that was made under our very noses during the early part of the twentieth century? York, please wake up and afford this important building of aviation history a bit of tender loving care! "The Memory of Place" is a piece of installation art commisioned for York St. Mary's and created by Keiko Mukaide. Fire water, glass, stone and light transform the interior of this deconsecrated church to create a spritual space in which to reflect on memory of loved ones. The installation is inspired by a Japanese ceremony "Shoro Nagashi". Visitors are invited to become involved by lighting a votive candle and floating it on the pool to connect modern life with our ancestors. 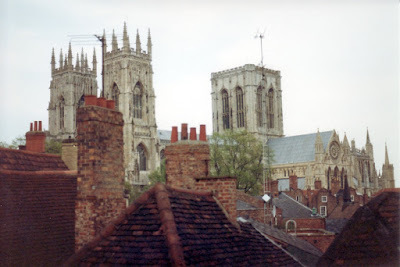 In mediaeval times there were 40 churchs within the walls of York. Of these 40, only 19 still remain, including St. Mary's Castlegate. York is full of interesting little passageways made popular in Mark Jones book "Snickelways of York". This one from Pavement leads down the side of the shoe shop to Lady Peckets Yard. Pavement may seem a strange name for a road but it was one of the first roads in York to be paved and the name has stuck. Lady Alice Peckett whose husband, John, owned the Golden Fleece Inn and was Lord Mayor of York around 1702. Continuing the Greenery theme for friend Chun See in Singapore, here is All Saints church Pavement with a tree in front of it. This church has a very interesting lantern tower which is lit at night making it even more picturesque. Notice the cycle in the foreground. York being a fairly flat city cycling is very popular, unfortunately bike theft is also a big prblem in the city and you need strong locks if you are a cyclist. Continuing my greenery theme, here is a photo of York Minster taken from the walls near Robin Hood Tower towards the Minster. In the middle ground in line with the central tower of the minster is the Minster Library. Deans Park and the ecclesiastical buildings around the Minster are probably the largest green space within the city walls. This strange looking object appeared in St. Sampsons square on Sunday morning and is part of the BA Festival of Science being held in York this week. It is called colourscape and consists of a series of translucent coloured tubes linked to form a maze. It is inflated by an electric pump and entered via an airlock. I am continuing with the challenge that I set myself to find greenery within the city walls. This haven of green is situated next to the St. Michael le Belfrey church which prompted Chun See's comment about greenery that led me to challenge myself to find green areas in the city. The monument is set within a small park and is a memorial to those men from York that were killed in South Africa during the Boer War. Although a tranquil haven it has been the scene recently of problems with youngsters congregating during the evenings, drinking alcohol and defacing the memorial with graffiti. Each year around the second weekend of September, York runs a Festival of Traditional Dance on Saturday and Sunday. The festival starts with a procession from the Guildhall, crosses St. Helen's Square and then proceeds down Davygate into Parliament street, finishing in the shady area between Marks and Spencer and Barclays Bank. The photograph above shows Ebor Morris performing the "Winster Processional". Below, is the last note of the processional as Ebor Morris arrive in Parliament Street. From here the 9 groups attending this year split up to perform in St. Sampsons Square, Kings Square and Parliament Street. Teams attending the event are Acorn, Beverly, Black Pig, Brackley, Ebor, English Miscellany, Inclognito, Jet Set, Minster Strays. 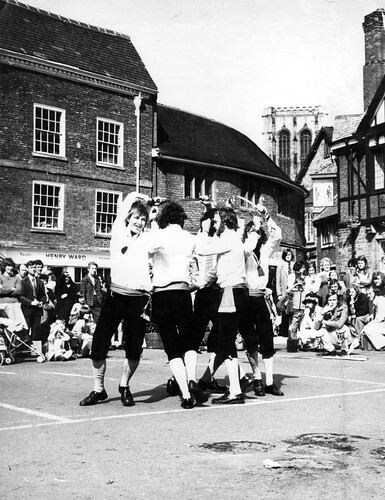 Styles of dancing included Cotswold, Long Sword, Border, Northwest Clog and Clog Stepping. Note for my good friend Chun See in Singapore, I have included another photograph with some of the rare greenery within the city walls. I hope to have some more photos of locations within the walls with trees and greenery over the next few days. I couldn't resist including this one of a visitor filming the procession. Following my good friend Chun See asking about greenery in the city in the comments of the article on St. Michael le Belfrey I went out yesterday to find some of the greenery I knew existed in York. This is St. Sampsons Square with nice shady trees around the edge of the square. Restaurants use the square on fine days to seat customers outside. Today the square will also be used for the York Traditional Dance Festival with a finale this afternoon performing for the Mayor of York. The square was not always so pleasant. During the 1960s and 1970s it was marked out as a car park. The trees were planted in the late 1970s. The coloured reflections in this leaded window caught my eye and then drew me to the intricate pattern of the glasswork. This is a window of the "Roman Bath" public house in St. Sampsons Square. The Roman bath has changed it's name a few times since it was built in the 18th century eventually being named the "Mail Coach" when it was taken on by a former mail coach driver George Penock in 1823 as landlord. It was a prominent coaching inn in those days making the name even more appropriate. It kept the name Mail Coach until the 1970s when the remains of a Roman Bath were found in the basement during alteration work. It then became known as the Roman Bath. There is a plate glass floor in the pub that allows you to view the roman remains and there is a small museum of Roman finds. Dwarfed by its larger neighbour St Michael le Belfry sits in the shadow of York Minster. This church holds the baptism records of Guy Fawkes one of the gunpowder plotters. It is sometimes joked that he was one of the few men to enter Parliament with honest intentions. The shrine of St. Margaret Clitherow, half way down the Shambles. Margaret Clitherow was daughter of the sherriff of York, Thomas Middleton, and married to a butcher with premises in the Shambles, John Clitherow. Having converted to Catholicism she started to hide priests and hold mass at a time when it was illegal to do so. She was eventually arrested , tried but would not enter a plea, which was punishable by being crushed to death. For further details visit the Catholic Encyclopedia entry for Margaret Clitherow. 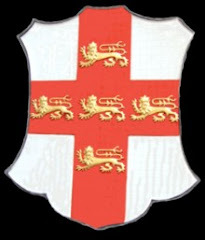 The Merchant Adventurers were the guild that controlled overseas trade. Access to the hall is either from Piccadily where this view was taken or from the ornate entrance passage in Fossgate. It must be over thirty years since I last visited this pub. I must drop in sometime soon and see if it is still the same inside! The pub building is set back from Stonegate and you gain entrance through this passageway. To find it when you are in Stonegate lift up your eyes and look for the signboard that stretches across the street. This house on Lord Mayors Walk can be seen from the city walls. The advertising slogan has been there a long time and has outlasted the product which I have never seen on sale anywhere. During the 1960s the advert had started to become very faint and was repainted during the 1970s as far as I remember. It is a favourite subject with many photographers and artists. Probably one of the best renditions was a series of prints done by York artist Baz Ward. His painting has one the old red Post Office Telephone boxes in it which shows how long ago he did the original painting. Several buildings in York have unusual ornamental adornments. I mentioned the Tom Adams cats in an earlier blog on Kings Square. The Stonegate area is rich in ornamental adornments like the Stonegate Devil shown above and the figurehead shown below. Keep your eyes open and raise them up from the shop windows to the level above. This shop window caught my eye because my wife loves rabbits and Guinea pigs. Also by chance the same day there was a jumble sale at St. Crux church and there was a pottery rabbit on the table for 50p. Not of the same superior quality as these in the window but good enough to buy as a silly gift that is now sitting on the mantlepiece waiting for her to return from visiting our eldest son in London. St. Crux church can be found at the bottom of The Shambles and often has a jumble sale in the morning and offers Tea/Coffee and cakes/biscuits at a reasonable price. It also next to York's shortest street, Whip Ma Whop Ma Gate.